Some people are born with naturally white teeth. They’re lucky that way, because most of us – in Plano, and all over the country – have to work at it, and work hard. But guess what? 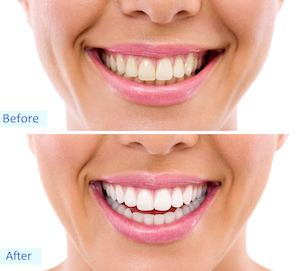 Professional whitening can help. The first thing to keep in mind seems like a no-brainer, but too many men and women don’t have a brushing ritual. Brushing twice a day with a soft toothbrush and fluoride toothpaste is one of the best ways to keep your teeth clean and prevent cavities. Teeth become discolored or stained because of what we eat and drink, but when we brush our teeth, it minimizes the damage. After brushing your teeth, use a fluoride rinse to finish the job. Fluoride helps get into the cracks where bacteria can be hiding away. When the bacteria is killed, it prohibits it from spreading and discoloring your teeth. When you’re shopping for a rinse, check the labels. Some ordinary mouthwashes don’t contain fluoride. Sometimes the discoloration is too severe to be reversed by home remedies. That’s why we offer other effective, in-office teeth whitening. The Plano Dentist works with each patient to find the best way to beautify their smiles. We also provide general and cosmetic dentistry.